Making your own baby food at home is nutritious, economical, and a lot easier than you think! When my daughter Sienna was born, one of the most common questions that people asked me was whether I was going to make my own baby food. Usually I would just laugh nervously and say something along the lines of “We’ll see…” The truth is that even though I had always pictured myself creating culinary masterpieces for my baby, in reality I couldn’t imagine finding the time to do it. Now that Sienna is nine months old, I am happy to say that I’ve been making all of her food and it’s not as hard as you would think. In fact, making homemade baby food is pretty easy. All you need is a food processor, blender or immersion blender and preferably a steamer (or steamer basket). If you can set aside a couple of hours one day, you can make enough baby food to last for weeks. Making baby food at home has become pretty popular in recent years and there are several varieties of baby food makers out there on the market. I received one as a gift but the truth is that you don’t need one to make baby food. The advantage of the one I have is that you can steam the food and puree it all in the same canister. But you can just as easily steam or roast the food and then transfer it to a food processor. Or even better, use an immersion blender and save yourself from washing a dish or two. How do you make baby food? It’s simple. Start with a ripe fruit or vegetable (or meat when your baby is a little older). Cook it by either lightly steaming, roasting or boiling it. Then puree it, add any seasonings and serve. Done! Not bad, right? I recommend lightly steaming or roasting your baby food rather than boiling it as a lot of the valuable nutrients can leech into the water with boiling. Many ripe fruits can be pureed without cooking, leaving all of the important nutrients intact. It’s nutritious. Commercially prepared baby food is sterilized at very high heat to increase shelf life, a process which kills a lot of nutrients and affects flavor and texture. Homemade baby food, on the other hand, retains most of its nutritional value, taste and texture. When you make your own baby food, you control the ingredients- it’s all natural, no additives or fillers. It will bring out the chef in you and perhaps make your baby a more adventurous eater. When you make your own food, you can create your own yummy combinations and expose your baby to a wide variety of flavors. Sienna loves when I mix apples, kale and sweet potatoes. Another one of her favorite combinations is cherries, pears and Greek yogurt. Once you make your baby food, you can portion it out and store it in individual BPA-free containers in the refrigerator. If you’re freezing your food, transfer the puree into multi-portion freezer trays or ice cube trays and place in the freezer. Then at mealtime you can pop out individual portions and heat them up. If you’re making large amounts of food, you can store the frozen cubes in BPA-free storage bags. I always label the bags with the type of puree and the date so I can keep track of how long they’ve been in the freezer. Another rule of thumb is to introduce only one new food at a time for at least 3 days. That way if your baby develops any adverse reactions, you’ll know what’s causing it. You can be creative when you make your own baby food, mixing and matching different ingredients. And don’t be afraid to add herbs and seasonings to your food- it’s good to expose babies to a wide range of flavors. And don’t worry if you have any extra baby food- you can use fruit and vegetable purees in lots of other dishes. Fresh fruit purees are delicious stirred into cocktails like bellinis. Frozen portions of fruit puree and Greek yogurt make great additions to a smoothie when you’re in a pinch! Peel and cut the fruit into pieces. Place in a steamer and steam until tender, 3-5 minutes. Note: If peaches are very ripe and soft, you can skip this step. Remove the fruit and transfer to a food processor or blender. Puree to desired consistency. Alternatively, you can use an immersion blender. Serve immediately or pour the puree into individual storage containers and refrigerate up to 3 days. 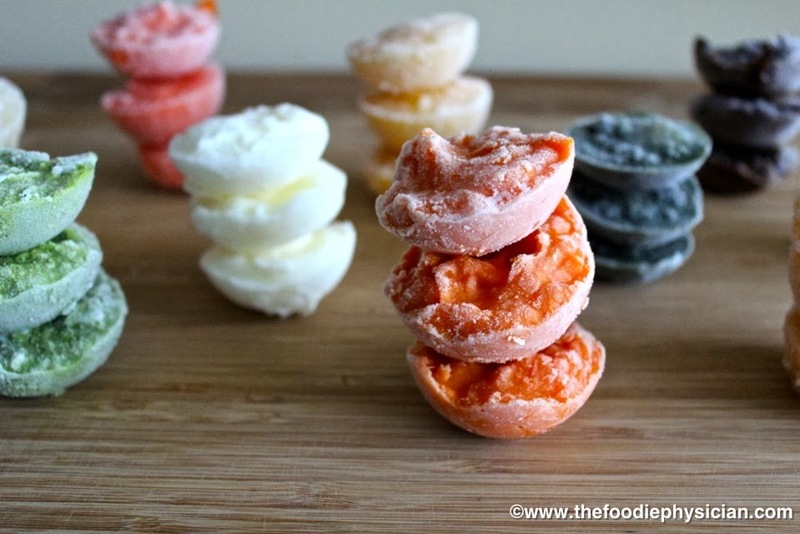 If freezing, transfer the puree to multi-portion freezer trays or ice cube trays and freeze. When you're ready to serve, pop out individual portions, heat and serve. Enjoy!!! For more great baby and toddler recipes, check out my cookbook, Natural Baby Food: Over 150 Wholesome, Nutritious Recipes for Your Baby and Toddler. It’s available on Amazon, Barnes & Noble, Penguin Random House, Target, Walmart, and anywhere books are sold! I love this post and the picture of Sienna, she's too cute! I used to make my own baby food (long ago!) for both of my girls and can probably count on one hand where they ate jarred food; though I never thought of preparing it ahead in batches and freezing it. GREAT Idea! Thanks, Carrie! Having baby food in the freezer has saved me more than once on busy weeknights! what a beautiful presentation of preparing and long term preservation of baby food. Never had this when my kids were small. It is worth the initial investment of time for a working mother. Easy to take out portions and defrost as needed. Sienna is beautiful. Bet she loves to eat your home made food. Thanks, ur! Yes, I definitely think it's been worth the initial investment of time. It's just as easy to defrost my homemade baby food as it is to open a jar!